Israeli soldiers injured, Tuesday, two young Palestinian men with live rounds, including one who suffered a serious injury, and caused dozens to suffer the effects of teargas inhalation, in addition to abducting four, in Kufur Qaddoum town, east of Qalqilia, in northern West Bank. Morad Eshteiwi, the media coordinator of the Popular Committee in Kufur Qaddoum, said at least sixty Israeli soldiers invaded the town, and attacked dozens of Palestinians who were nonviolently marching, commemorating the 54th anniversary of the establishment of Fateh movement. He added that the soldiers used live fire, gas bombs, concussion grenades and rubber-coated steel bullets, while many youngsters responded by throwing rocks and empty bottles at them. 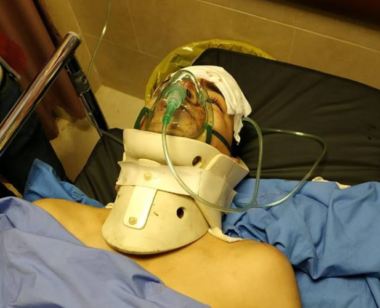 Eshteiwi added that the soldiers shot Mohammad Adel Eshteiwi, with a live round in his back, and added that the bullet was lodged in his lung, before he was rushed to a local hospital, suffering very serious wounds. Another Palestinian, identified as Yazan Montaser Barham, 19, was injured by bullet fragments in his back, and was also rushed to a hospital. The soldiers detained a Palestinian Red Crescent ambulance and tried to prevent the medics from providing aid to the wounded Palestinians, by threatening to shoot them. During the invasion, the soldiers abducted Fadel Mohammad Eshteiwi, 19, his brother ‘Ala, 26, in addition to Sabri Ata Eshteiwi, 28, and Tareq Nabil Ali, 16.